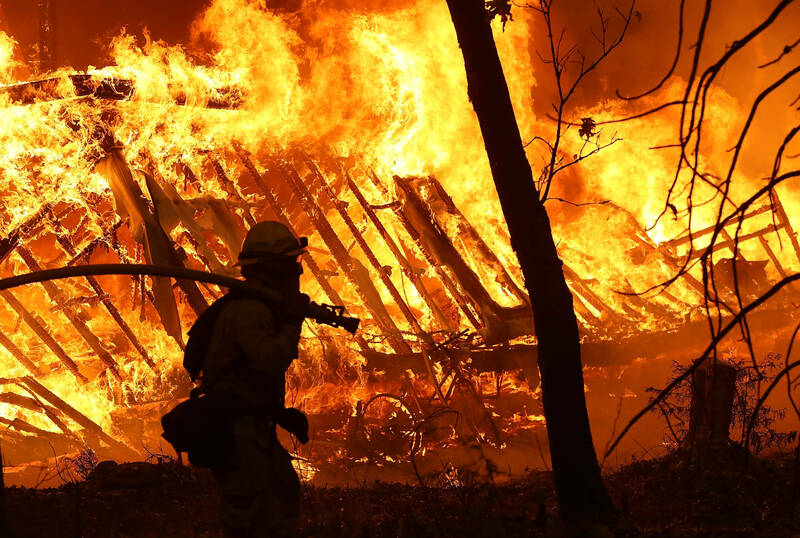 A Cal Fire report on injuries suffered by five firefighters in the first day of the Camp Fire in Butte County gives graphic new details of the chaos that crews confronted as violently shifting winds turned a wildland blaze into an explosive urban firestorm. The agency Green Sheet focuses on two episodes in the fire's first 24 hours: one in which three firefighters were burned after becoming trapped by a sudden wind shift and a second in which two firefighters trying to save homes were injured by an exploding propane tank. 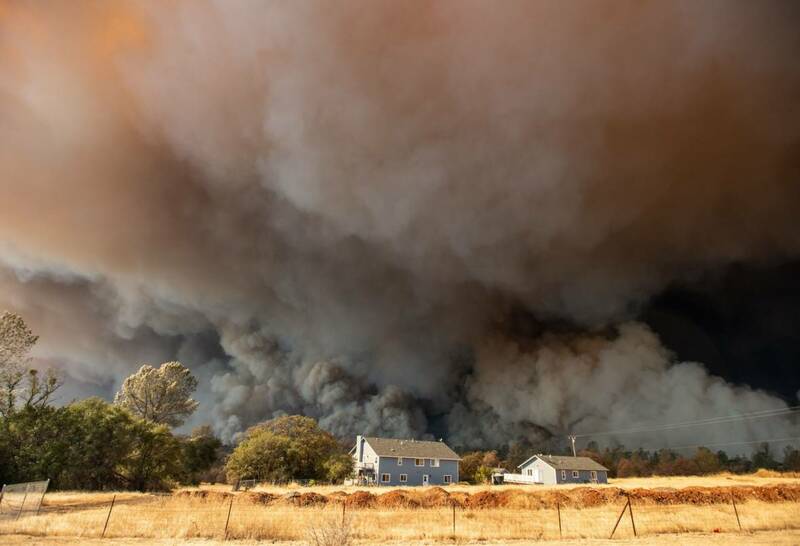 The report also sets the scene for the devastating fire — drought, high winds and areas of thick vegetation that had not burned in recorded history. Those conditions led to a blaze that moved with shocking speed on Nov. 8, consuming an estimated 76 acres a minute and advancing 15 miles from its origin near the Feather River community of Pulga in just 12 hours. The fire ultimately killed at least 86 people and burned 14,000 homes in Paradise and the communities of Concow and Magalia. 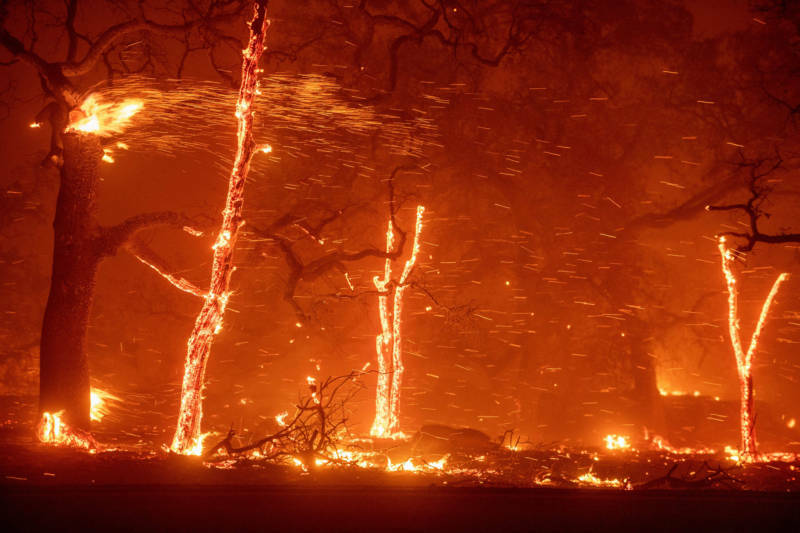 In describing the fire's ferocity as it raced through the town of Paradise, the Green Sheet resorts to a comparison drawn not from previous wildfires, but from the annals of World War II. 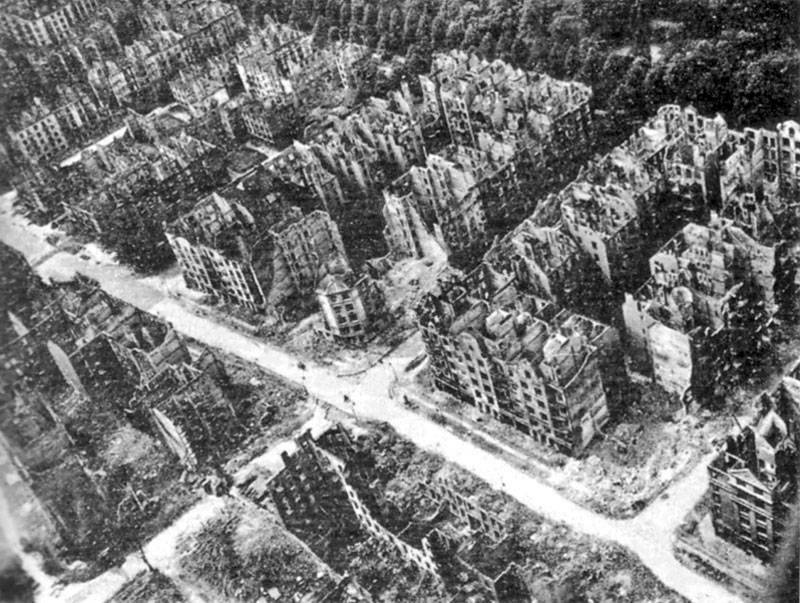 "When the fire reached the town of Paradise," the Green Sheet says, "an urban firestorm began to spread from building to building independent of the vegetation, similar to the firestorm that consumed Hamburg, Germany, in 1943." In July and August of that year, British and U.S. planes carried out raids for eight days and nights that destroyed much of the city and killed at least 34,000 people. The Camp Fire Green Sheet says the first three firefighters were hurt as they prepared to conduct a defensive firing operation — often called a backfire — along Rattlesnake Flats Road and Clark Road, just outside Paradise, at around 2:45 p.m. on Nov. 8. At that point the fire was estimated to be one-quarter mile north of a team including three inmate firefighters and edging slowly to the south toward them. But the winds suddenly changed direction and "significantly increased velocity," propelling the fire toward the team, the report says. As flames roared toward the firefighters, several of them got cut off as they tried to retreat. Fire was also rushing toward a second group of firefighters. One of the inmate firefighters tried to escape by dodging through the advancing flames but ran into a barbed-wire fence on the north side of Rattlesnake Flats Road and was burned. Another inmate firefighter ran to the other side of the road and tried to jump over a fence there. His gear got caught on barbed wire, and he fell face down on the ground. The fire overtook him, the report says, "igniting his hair, beard and mustache, resulting in burns to his face and neck." A Cal Fire fire captain also suffered burns in the incident. Eventually, the three firefighters were hospitalized. The injured Cal Fire captain was released from the Firefighters Burn Institute at UC Davis just over a week ago, according to Cal Fire spokesman Scott McLean. That firefighter is at home recuperating, McLean said Friday morning in an email. State prison officials say one of the inmate firefighters, an unidentified 27-year-old, received burns to 3 percent of his body. The other inmate, aged 39, received minor injures. Both men were treated at outside hospitals and released back to the California Department of Corrections and Rehabilitation, according to the agency's spokeswoman, Vicky Waters. The second incident related in the Green Sheet occurred before dawn the following morning in the community of Magalia as a Cal Fire engine strike team tried to protect structures. The crew was attempting to contain two small spot fires near Ponderosa Way and Chestnut Circle when a propane tank about 200 feet away exploded. A fire captain was hit with a barrage of burning sticks, branches, pine cones and bark as well as molten aluminum from the 250-gallon tank. A second firefighter was hit with embers and pieces of a fence. He was knocked down to one knee and became disoriented. McLean says the two firefighters received minor burns and were hospitalized, released the same day and returned to work. California's Department of Occupational Safety and Health is investigating the two incidents, according to agency spokesman Frank Polizzi. Among the "lessons learned" listed in the report are notes on the importance of wearing personal protective equipment, including gloves, goggles and shrouds that drop below the rear and sides of firefighter hardhats and protect the neck and face.